Los Angeles Overturns Its Brand New Ban On Marijuana Shops : The Two-Way In a preliminary vote, the Los Angeles City Council reversed its ban on medical marijuana dispensaries. The final vote will come next week, following heavy pressure from marijuana activists. 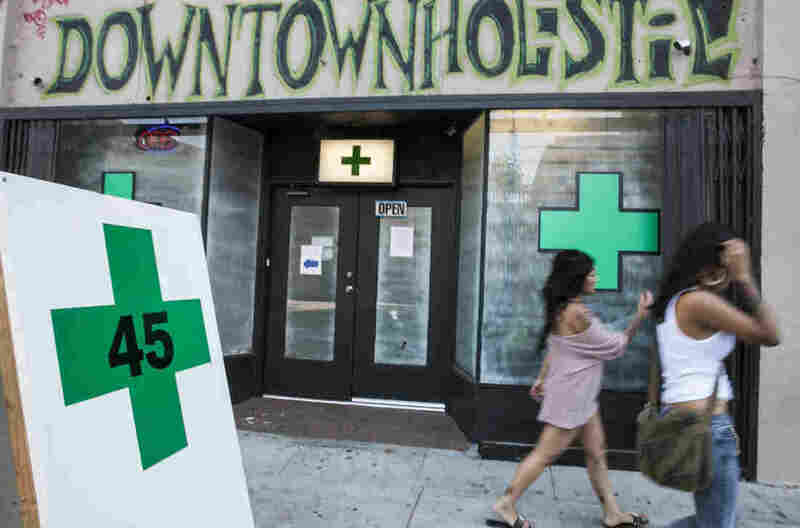 Pedestrians pass a medical marijuana dispensary in the Echo Park area of Los Angeles on July 24, 2012. Faced with several lawsuits, petitions with thousands of signatures and heavy criticism, the Los Angeles City Council reversed itself yesterday. In a preliminary vote, members ended the city's ban on medical marijuana dispensaries. The ban was only enacted in July. The council vote was 11-2 and a final vote must be held next week, according to the Contra Costa Times. Members heard from one of their own: Councilman Bill Rosendahl, who has cancer and uses medically prescribed marijuana to deal with his treatment's side effects. Rosendahl wondered where he would find it if the ban remained in place. "The fact is there are people like me who need to have access to it," he nearly whispered, according the Times. Tens of thousands of people signed petitions urging the medical marijuana store ban repeal, notes the Los Angeles Times. These were backed by activists, including a group of medical marijuana dispensaries and a union which has organized workers at more than 50 dispensaries. There may be as many as 1,000 medical marijuana dispensaries in the Los Angeles area. Some of the pot shops are small - perhaps the size of a corner store. But others are much larger, including multi-million dollar for-profit businesses. Frank Stolze, who's followed this issue for SCPR, talked with L.A. police chief Charlie Beck. The chief worries that the bigger medical marijuana operators aren't following state law. "(They) not only cause a nuisance to the community but cause a public danger because of a very toxic mixture of high-value narcotics and a lot of cash." The issue could come down to a federal - state tug of war over laws and regulations. It's legal under state law to obtain medical marijuana in California, and, under a recent state appellate court ruling, for licensed dispensaries to sell it. But it's still a federal crime to use and sell marijuana and there are no exceptions; federal authorities are still raiding some Los Angeles area pot dispensaries or ordering others to close, the L.A. Times reports.